Featuring a full head-to-toe range of apparel, accessories and footwear, PUMA Golf has revealed its 'Play Loose' Collection, which has been inspired to emulate the relaxed feel of surf culture, bringing something different to the golf course, a line that will be showcased by Rickie Fowler at the Farmers Insurance Open at Torrey Pines, before wearing it again for the Honda Classic in Florida, ensuring that he Plays Loose on both sides of the United States. 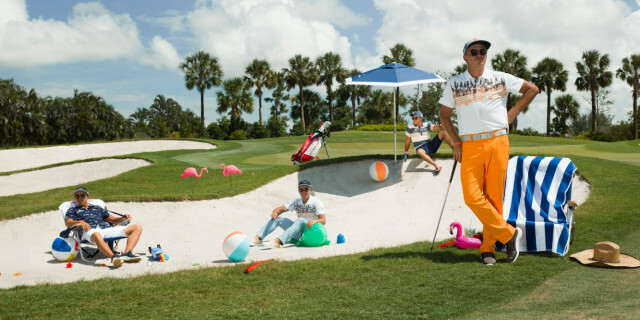 Play Loose is inspired by vintage surf style, incorporating a custom coastal design along with subtle golf elements, for a fresh collection that is casual yet refined, with all the performance needed to dominate on course and look effortlessly cool off course. The collection balances sophistication with casual wear, refined chill if you will, with subtle attention to detail that is just as at home on the beach as it is on the links. The Paradise Shirt - Rickie will kick-off play at Torrey Pines in this striking woven button-up with an all-over tropical-inspired print complete with pine trees, surfboards and crossed golf clubs. The peacoat top mimics a traditional button-up while incorporating four-way stretch material and all the performance elements needed to play 18. The Pipeline Polo– Inspired by old-school surf culture, the aptly named Pipeline Polo features a modern twist on a retro stripe design. Our FusionYarn Flex fabric gives the polo a more lifestyle look and feel. It comes in a white/chocolate brown and white/peacoat colorways. The Pines Polo– Featuring a custom coastal inspired print on the chest, this lightweight Pines Polo, available in white/chocolate brown or a white/ashley blue colorway, will have golfers turning heads as they crush drives and sink putts. Also utilizes our FusionYarn Flex fabric. The Onshore Hoodie is designed with a heathered fleece fabric that is perfect for cool mornings when headed to the course or the gym. The hoodie features a solid contrasting stripe across the chest and is available in chocolate brown and peacoat colorways that coordinate with the rest of the Play Loose Collection. Tropics Tee – Classic, comfortable, cotton & polyester blend tee with all the tropical vibes. Available in a bright white & grey heather, the Tropics Tee features a coastal graphic on the front for an easy to wear, laidback shirt that will go with everything. Jackpot Pants and Short – These first-in-class bottoms incorporate all the elements needed to hit the pants jackpot - fabric, fit and function. These pants and shorts utilise a moisture-wicking polyester fabric, stretch-mesh waistband and are designed to fit perfectly. The Play Loose Collection includes pants and shorts in two unique colorways: ashley blue and chocolate brown. Hang Ten Boardshort – Boardshorts to the golf course? Why not! These boardshorts are the perfect spring break or summer time piece to wear to a beach BBQ, the pool or to the course, when having fun is more important than the score. IGNITE NXT Solelace Play Loose - The new IGNITE NXT SOLELACE combines the comfort of IGNITE foam, with the superior traction and stability of NXT technology and the brand’s most innovative closure system to date, SOLELACE. SOLELACE uses super strong and lightweight TPU units attached directly to the midsole to allow the laces of the shoes to completely envelop a golfer’s foot, offering 360-degree support. The design allows the laces of the shoes to pull the midsole and outsole of the shoe via the SOLELACE units, rather than the laces simply tightening the upper around the foot like in a traditional shoe, which helps provide the ultimate ground feel. The Play Loose edition is available in a cool Chocolate Brown colorway. Kahala Slip-On Shoes – Inspired by the surf lifestyle, the Kahala Slip-On features a canvas upper with the innovative Hidden Traction outsole to provide you a casual, easy to slip-on look that still performs on the course. Available in a cool khaki colorway. Utility Patch 110 Snapback Cap – Give your game face some shade with the Utility Patch 110 Snapback Cap featuring a moisture-wicking, performance sweatband and two interchangeable patches so you can customize your style. One is a peacoat patch with white PUMA cat, the other is a unique striped pattern inspired by vintage surf style. P 110 Snapback Cap – Rickie’s go-to cap on course, the Play Loose version comes in a cool quiet shade colorway with an orange, 3D embroidered P logo. Ultralite Stretch Belt – This belt features a progressive silhouette and low-profile design combined with lightweight stretch material for limitless movement and extreme comfort so you can swing out of your shoes without swinging out of your tucked in polo. Available in a coordinating peacoat hue. The PUMA Golf Play Loose Collection is available now, here: https://www.cobragolf.co.uk/pumagolf/play-loose and select retailers.